1 Bow down Thine ear, Jehovah, answer me, For I am afflicted and poor. 2 Keep my soul, for I am favoured [by Thee], Save Thy servant, O Thou my God, That trusts in Thee. 3 Be gracious to me, Lord, For to Thee I cry all the day. 4 Rejoice the soul of Thy servant, For to Thee, Lord, do I lift up my soul. 5 For Thou, Lord, art good and forgiving, And plenteous in loving-kindness to all who call on Thee. 6 Give ear, Jehovah, to my prayer, And take heed to the voice of my supplications. 7 In the day of my straits will I call [on] Thee, For Thou wilt answer me. 8 There is none like Thee among the gods, O Lord, And no [works] like Thy works. 10 For great art Thou and doest wonders, Thou art God alone. 11 Teach me, Jehovah, Thy way, I will walk in Thy troth, Unite my heart to fear Thy Name. 12 I will thank Thee, O Lord my God, with all my heart, And I will glorify Thy Name for ever. 13 For Thy loving-kindness is great towards me, And Thou hast delivered my soul from Sheol beneath. 14 O God, the proud have risen against me, And a crew of violent men have sought after my soul, And have not set Thee before them. 15 But Thou, Lord, art a God compassionate and gracious, Long-suffering and plenteous in loving-kindness and troth. 16 Turn to me and be gracious to me, Give Thy strength to Thy servant, And save the son of Thy handmaid. 17 Work for me a sign for good, That they who hate me may see and be ashamed, For Thou, Jehovah, hast helped me and comforted me. This psalm is little more than a mosaic of quotations and familiar phrases of petition. But it is none the less individual, nor is the psalmist less heavily burdened, or less truly beseeching and trustful, because he casts his prayer into well-worn words. God does not give "originality" to every devout man; and He does not require it as a condition of accepted prayer. Humble souls, who find in more richly endowed men's words the best expression of their own needs, may be encouraged by such a psalm. Critics may think little of it, as a mere cento; but God does not refuse to bow His ear, though He is asked to do so in borrowed words. A prayer full of quotations may be heartfelt, and then it will be heard and answered. This psalmist has not only shown his intimate acquaintance with earlier devotional words, but he has woven his garland with much quiet beauty, and has blended its flowers into a harmony of colour all his own. There is no fully developed strophical arrangement but there is a discernible flow of thought, and the psalm may be regarded as falling into three parts. The first of these (vv. 1-5) is a series of petitions, each supported by a plea. The petitions are the well-worn ones which spring from universal need, and there is a certain sequence in them. They begin with "Bow down Thine ear," the first of a suppliant's desires, which, as it were, clears the way for those which follow. Trusting that he will not ask in vain, the psalmist then prays that God would "keep" his soul as a watchful guardian or sentry does, and that, as the result of such care, he may be saved from impending perils. Nor do his desires limit themselves to deliverance. They rise to more inward and select manifestations of God's heart of tenderness, for the prayer "Be gracious" asks for such, and so goes deeper into the blessedness of the devout life than the preceding. And the crown of all these requests is "Rejoice the soul of Thy servant," with the joy which flows from experience of outward deliverance and of inward whispers of God's grace, heard in the silent depths of communion with Him. It matters not that every petition has parallels in other psalms, which this singer is quoting. His desires are none the less his, because they have been shared by a company of devout souls before him. His expression of them is none the less his, because his very words have been uttered by others. There is rest in thus associating oneself with an innumerable multitude who have "cried to God and been lightened." The petition in ver. 1 is like that in Psalm lv. 2. Ver. 2 sounds like a reminiscence of Psalm xxv. 20; ver. 3 closely resembles Psalm lvii. 1. The pleas on which the petitions are grounded are also beautifully wreathed together. 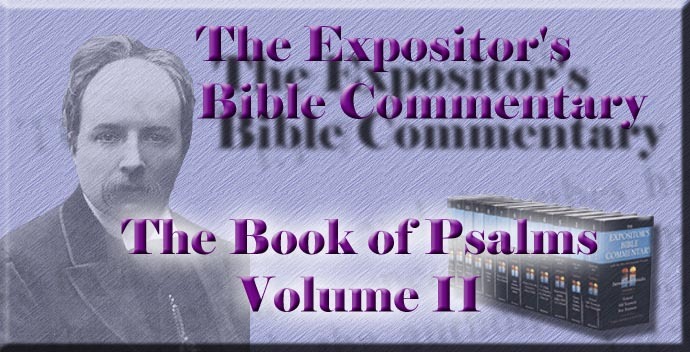 First, the psalmist asks to be heard because he is afflicted and poor (compare Psalm xl. 17). Our need is a valid plea with a faithful God. The sense of it drives us to Him; and our recognition of poverty and want must underlie all faithful appeal to Him. The second plea is capable of two interpretations. The psalmist says that he is Chasid; and that word is by some commentators taken to mean one who exercises, and by others one who is the subject of, Chesed--i.e., loving-kindness. As has been already remarked on Psalm iv. 3, the passive meaning--i.e., one to whom God's loving-kindness is shown--is preferable. Here it is distinctly better than the other. The psalmist is not presenting his own character as a plea, but urging God's gracious relation to him, which, once entered on, pledges God to unchanging continuance in manifesting His loving-kindness. But, though the psalmist does not plead his character, he does, in the subsequent pleas, present his faith, his daily and day-long prayers, and his lifting of his desires, aspirations, and whole self above the trivialities of earth to set them on God. These are valid pleas with Him. It cannot be that trust fixed on Him should be disappointed, nor that cries perpetually rising to His ears should be unanswered, nor that a soul stretching its tendrils heavenward should fail to find the strong stay, round which it can cling and climb. God owns the force of such appeals, and delights to be moved to answer, by the spreading before Him of His servant's faith and longings. But all the psalmist's other pleas are merged at last in that one contained in ver. 5, where he gazes on the revealed Name of God, and thinks of Him as He had been described of old, and as this suppliant delights to set to his seal that he has found Him to be--good and placable, and rich in loving-kindness. God is His own motive, and Faith can find nothing mightier to urge with God, nor any surer answer to its own doubts to urge with itself, than the unfolding of all that lies in the Name of the Lord. These pleas, like the petitions which they support, are largely echoes of older words. "Afflicted and poor" comes, as just noticed, from Psalm xl. 17. The designation of "one whom God favours" is from Psalm iv. 3. "Unto Thee do I lift up my soul" is taken verbatim from Psalm xxv. 1. The explication of the contents of the Name of the Lord, like the fuller one in ver. 15, is based upon Exod. xxxiv. 6. Vv. 6-13 may be taken together, as the prayer proper, to which vv. 1-5 are introductory. In them there is, first, a repetition of the cry for help, and of the declaration of need (vv. 6, 7); then a joyful contemplation of God's unapproachable majesty and works, which insure the ultimate recognition of His Name by all nations (vv. 8-10); then a profoundly and tenderly spiritual prayer for guidance and consecration--wants more pressing still than outward deliverance (ver. 11); and, finally, as in so many psalms, anticipatory thanksgivings for deliverance yet future, but conceived of as present by vivid faith. Echoes of earlier psalms sound through the whole; but the general impression is not that of imitation, but of genuine personal need and devotion. Ver. 7 is like Psalm xvii. 6 and other passages; ver. 8 a is from Exod. xv. 11; ver. 8 b is modelled on Deut. iii. 24; ver. 9, on Psalm xxii. 27; ver. 11 a, on Psalm xxvii. 11; ver. 11 b, on Psalm xxvi. 3; "Sheol beneath" is from Deut. xxxii. 22. But, withal, there are unity and progress in this cento of citations. The psalmist begins with reiterating his cry that God would hear, and in ver. 7 advances to the assurance that He will. Then in vv. 8-10 he turns from all his other pleas to dwell on his final one (ver. 5) of the Divine character. As, in the former verse, he had rested his calm hope on God's willingness to help, so now he strengthens himself, in assurance of an answer, by the thought of God's unmatched power, the unique majesty of His works and His sole Divinity. Ver. 8 might seem to assert only Jehovah's supremacy above other gods of the heathen; but ver. 10 shows that the psalmist speaks the language of pure Monotheism. Most naturally the prophetic assurance that all nations shall come and worship Him is deduced from His sovereign power and incomparableness. It cannot be that "the nations whom Thou hast made" shall for ever remain ignorant of the hand that made them. Sooner or later that great character shall be seen by all men in its solitary elevation; and universal praise shall correspond to His sole Divinity. The thought of God's sovereign power carries the psalmist beyond remembrance of his immediate outward needs, and stirs higher desires in him. Hence spring the beautiful and spiritual petitions of ver. 11, which seek for clearer insight into God's will concerning the psalmist's conduct, breathe aspirations after a "walk" in that God-appointed way and in "Thy troth," and culminate in one of the sweetest and deepest prayers of the Psalter: "Unite my heart to fear Thy Name." There, at least, the psalmist speaks words borrowed from no other, but springing fresh from his heart's depths. Jer. xxxii. 39 is the nearest parallel, and the commandment in Deut. vi. 5, to love God "with all thine heart," may have been in the psalmist's mind; but the prayer is all his own. He has known the misery of a divided heart, the affections and purposes of which are drawn in manifold directions, and are arrayed in conflict against each other. There is no peace nor blessedness, neither is any nobility of life possible, without whole-hearted devotion to one great object; and there is no object capable of evoking such devotion or worthy to receive it, except Him who is "God alone." Divided love is no love. It must be "all in all, or not at all." With deep truth, the command to love God with all the heart is based upon His Unity--"Hear, O Israel: The Lord thy God is one Lord; and thou shalt love the Lord thy God with all thine heart" (Deut. vi. 4). The very conception of religion requires that it should be exclusive, and should dominate the whole nature. It is only God who is great enough to fill and engage all our capacities. Only the mass of the central sun is weighty enough to make giant orbs its satellites, and to wheel them in their courses. There is no tranquillity nor any power in lives frittered away on a thousand petty loves. The river that breaks into a multitude of channels is sucked up in the sand without reaching the ocean, and has no force in its current to scour away obstructions. Concentration makes strong men; consecration makes saints. "This one thing I do" is the motto of all who have done anything worthy. "Unite my heart to fear Thy Name" is the prayer of all whose devotion is worthy of its object, and is the source of joy and power to themselves. The psalmist asks for a heart made one with itself in the fear of God, and then vows that, with that united heart, he will praise his delivering God. As in many other psalms, he anticipates the answers to his prayers, and in ver. 13 speaks of God's loving-kindness as freshly manifested to him, and of deliverance from the dismal depths of the unseen world, which threatened to swallow him up. It seems more in accordance with the usage in similar psalms to regard ver. 13 as thus recounting, with prophetic certainty, the coming deliverance as if it were accomplished, than to suppose that in it the psalmist is falling back on former instances of God's rescuing grace. In the closing part (vv. 14-17), the psalmist describes more precisely his danger. He is surrounded by a rabble rout of proud and violent men, whose enmity to him is, as in so many of the psalms of persecuted singers, a proof of their forgetfulness of God. Right against this rapid outline of his perils, he sets the grand unfolding of the character of God in ver. 15. It is still fuller than that in ver. 5, and, like it, rests on Exod. xxxiv. Such juxtaposition is all that is needed to show how little he has to fear from the hostile crew. On one hand are they, in their insolence and masterfulness, eagerly hunting after his life; on the other is God with His infinite pity and loving-kindness. Happy are they who can discern high above dangers and foes the calm presence of the only God, and, with hearts undistracted and undismayed, can oppose to all that assails them the impenetrable shield of the Name of the Lord! It concerns our peaceful fronting of the darker facts of life, that we cultivate the habit of never looking at dangers or sorrows without seeing the helping God beside and above them. The psalm ends with prayer for present help. If God is, as the psalmist has seen Him to be, "full of compassion and gracious," it is no presumptuous petition that the streams of these perfections should be made to flow towards a needy suppliant. "Be gracious to me" asks that the light, which pours through the universe, may fall on one heart, which is surrounded by earth-born darkness. As in the introductory verses, so in the closing petitions, the psalmist grounds his prayer principally on God's manifested character, and secondarily on his own relation to God. Thus in ver. 16 he pleads that he is God's servant, and "the son of Thy handmaid" (compare Psalm cxvi. 16). That expression does not imply any special piety in the psalmist's mother, but pleads his hereditary relation as servant to God, or, in other words, his belonging by birth to Israel, as a reason for his prayers being heard. His last petition for "a sign" does not necessarily mean a miracle, but a clear manifestation of God's favour, which might be as unmistakably shown by an every-day event as by a supernatural intervention. To the devout heart, all common things are from God, and bear witness for Him. Even blind eyes and hard hearts may be led to see and feel that God is the helper and comforter of humble souls who trust in Him. A heart that is made at peace with itself by the fear of God, and has but one dominant purpose and desire, will long for God's mercies, not only because they have a bearing on its own outward well-being, but because they will demonstrate that it is no vain thing to wait on the Lord, and may lead some, who cherished enmity to God's servant and alienation from Himself, to learn the sweetness of His Name and the security of trust in Him.